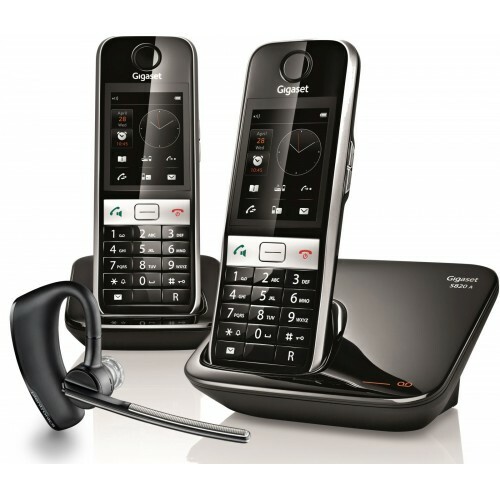 With its innovative call management features and built-in answer machine recording up to 55 minutes of voicemails, this pair of Gigaset S820A cordless DECT phones also ships with the Voyager Legend Bluetooth headset from Plantronics. Thanks to the user-friendly, icon-powered interface and large colour touchscreen, you can easily select your favourite functions and add them to the home screen. Additionally, you can block unwanted callers, view recent numbers and specify silent periods for when you don't want to be disturbed. Combined with a high-end Bluetooth headset, the Gigaset S820A offers comfort and convenience for both home and office use.